The purpose of the Tyler’s Way Foundation is to promote character in children, support community and embrace families of loss. 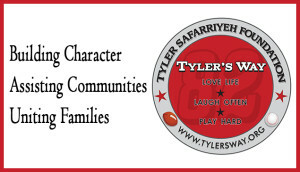 CHARACTER: Tyler’s Way promotes building character in youth and teaches the value of giving back to community. 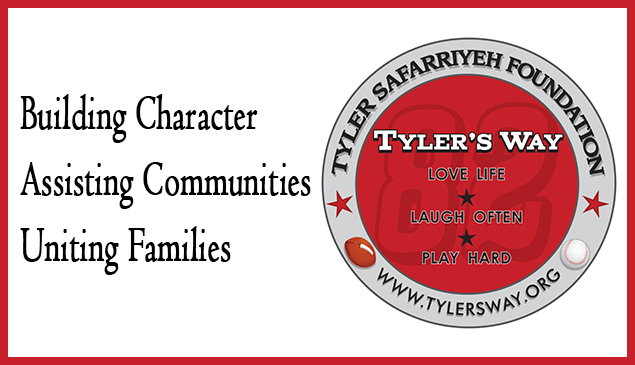 Tyler’s way will participate in local elementary and middle school character building lessons and will award a rising sixth grader and seventh grader The Tyler Safarriyeh Character Ed Award to be nominated and selected by the school’s staff and teachers. COMMUNITY: Tyler’s Way assists children by providing sports scholarships to families in need who have children participating in sports at recreational or school programs. In addition, the Foundation has committed to three annual scholarships to student athletes graduating from Johns Creek, GA High Schools. Applications for this TS82 Scholarship are reviewed and awarded by the Tyler’s Way Scholarship Committee. FAMILY: Tyler’s Way brings families together to heal from grief while promoting values and unity within the family. Tyler’s Way assists families in need by providing a gift baskets filled with healing and coping tools, to help the family heal. In addition, Tylers’s Way coordinates community events for all families that promote unity and values and inspire families to connect. “If you wish to experience peace, provide peace for another.” Tenzin Gvatso, 14th Dalai Lama. It is our hope that you find peace as you listen to and watch this video in memory of our beloved Tyler.